The BSA Ultra SE provides top specifications, performance and unique handling qualities in a stylish, affordable package. Perfectly balanced and designed for fast target acquisition, the Ultra SE is purpose built to take your sporting shooting to an exciting new level. It's a lightweight stalker, a super-compact ratter, the ideal hide-hunting rifle and much, much more. It's the BSA Ultra SE – a genuine mini super gun! We are now offering this superb rifle as part of this Full Combo kit which includes the BSA Ultra SE Tactical with a 10 shot magazine, a Hawke Vantage IR+ 3-12x50 AO IR scope, a LED torch, a BSA Tactical Gun bag, and a Top Quality 3 Ltr charging bottle to finish it off. We are also including a pack of our match targets, and a tin of pellets free of charge to get you going. 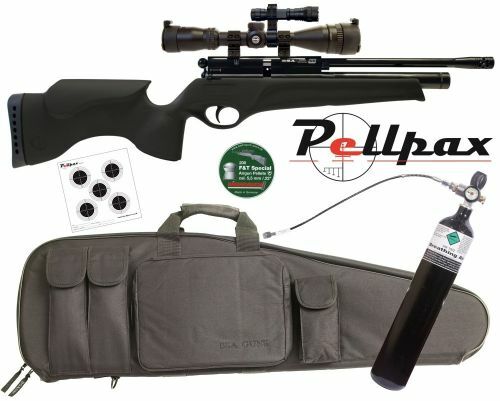 With a RRP of £925 when purchased separately, this kit offers a great saving to you, and is ideal if you looking to start with a PCP rifle.